The name of the window speaks for itself. Picture windows are a non-operable window that is designed to fill large spaces in a wall, inviting more light into the house without obstructing your view. Used mostly for décor purposes, it is applicable to any space that needs more light. Because these windows are static and do not open, it is a common practice to install a single- or double-hung window next to it for a better ventilation. To learn more about the perfect combination of window structures, give our experts a call. Pictures windows can be produced in a variety of shapes and finishes, and that is why we urge you not to hold back when you imagine the window of your dreams. The Milano Windows and Doors Inc. team will custom make it for you. The picture window is extremely energy efficient since it is fixed within the open space and has no movable parts. Due to its shape versatility, it can add charm to any space. A wide range of grill designs and trim options give you a lot of customization options. Fusion-welded frames ensure window durability and resistance to any weather conditions. You can choose double- and triple-pane glass insulation for those cold winter months. In case you are thinking about selling your property, keep in mind that picture windows can dramatically increase the value of your home. Call Milano Windows and Doors Inc. When it comes to installing picture windows, it is important to make sure that you get the right professionals for this job. Milano windows bring only those products that meet Canadian and USA window standards and are CCMC approved to the market. Our teams are trained to be courteous, helpful, and to treat your home with the utmost respect. Upon installation, you can be sure that your space will be pristine and your new doors and windows will look amazing. If you have questions, do not hesitate to contact us today, and a member of our team will be happy to help you. Should I Repair or Replace My Windows? Fantastic company! We had a sliding glass door installed and were really impressed with the product, competitive pricing and especially the Milano team! From our 1st contact with Anna, to Matthew who came and gave us a quote, to the installers, who did an excellent job and keep their work area very clean.....from start to finish a top notch experience!! Highly recommend!! 25% OFF ALL PRODUCTS! Limited Time Offer! 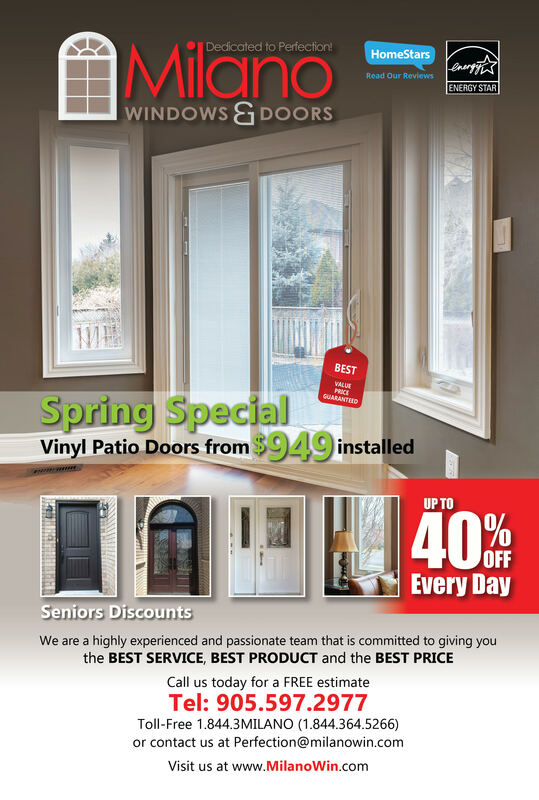 Milano Windows & Doors Inc. Please submit your feedback, we will do our best to fix the issue!